A couple of years ago Mars and I were invited to be guests on the “Mouth of Wonder” on KSFR public radio in Santa Fe. Stacy, a good friend of our daughter-in-law and son, is the show’s host. Monica and Bram are semi-regulars on the program and we had been on once before, on our annual Christmas visit to New Mexico the previous year. We had a few weeks lead-time to prepare something to talk about. But Mars knew immediately that our topic would be soup for breakfast – part of the way we survived the Halloweensnowstorm of 2011. This was not the first time that the two of us battled the elements with healthily fortified, hot liquids. In Quebec City for a destination wedding in mid-February a few years back we walked the town in sub-sub-zero temperatures invigorated by daily lunch-stops for Québécois-Style Soupe Aux Pois accompanied by a pate and large mugs of hot chocolate. How cold did it get? It reached the one point on the Fahrenheit and Celsius scales where the temperatures in degrees are equal. Surely we could survive eating breakfast in a household almost ninety degrees F warmer. Soup is normally one of our first thoughts whenever we arrive in Santa Fe – for several reasons. 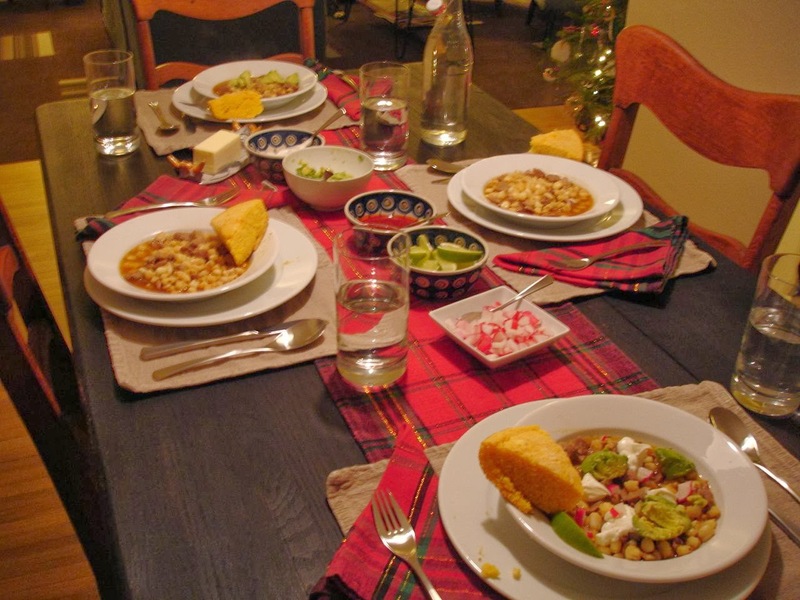 First there is our daughter-in-law’s Christmas Eve posole (dumbed down picante-wise for us spice-wimp easterners), built around the best ingredient name ever – nixtamalized cacahuazintle corn. Considered a stew in some quarters, where the liquid to solid ration is lower, Monica’s Santa Fe-Style Sopa Con Alkaline-Soaked Maize is the epicurean apogee of our winter visit – even if the temperature isn’t sub-zero. Secondly, on vacation, because we end up eating out so much, we can easily overindulge. Soup for lunch helps us keep from doing that. And we have encountered lots of really good restaurant soups over our many times in town – among them Blue CornCafé’s Tortilla, San Marcos Feed Store and Cafe's chicken vegetable (don’t become emotionally attached to any of the free-range fowls wandering the grounds on your way in – kidding! ), and pretty much any San Francisco Bar & Grill soup of the day (with chips and salsa). Finally – and remember Mars and I are no-nonsense, get-it-done New Englanders – soup is the only luncheon item we have ordered in Santa Fe that sometimes does not fall into the black hole of “WTF happened to our order?” – a malady that seems to afflict many restaurants in the “city different”. For us, ordering soup in Santa Fe is as much about maintaining our northeastern sanity and values in the midst of the southwestern time warp that passes for customer service – as it is about enjoying a warm, nourishing meal. So (with all that soup history and even more that I didn't know about)on Halloween weekend when Connecticut was struck by a surprise snowstorm, and the lights went out Mars had her meal plan ready. The snowfall was worsened by the fact that a significant number of leaves had not yet fallen off the significant number of trees that make our state so colorful during the month of November. And the thirty-degree temperatures. The resulting wet precipitation stuck to the leaves, weighing down and breaking large branches, which in turn fell onto electrical lines causing over 800,000 power outages. Our house was in the dark for seven days and nights. Fortunately for us we belonged to a health club that had electric power where we were able to shower. And our town provided a generator-driven shelter for hanging out during the remainder of the day and, if we chose to, for overnight sleeping. We decided to spend our nights at home – largely because we had running (albeit cold) water and our natural gas stove allowed us to do stovetop cooking – specifically to heat canned soup for breakfast. It turns out that breaking the morning fast with a warm potage was one of the enjoyable parts of Mars’ upbringing, and she looked upon our short-term imprisonment in the dark as an opportunity to introduce me to the joys of fighting the morning cold with a steaming bowl. My culinary formative years were more conventional – I never had lunch or dinner foods before noon. A few supermarkets were open – on generator power – with limited non-perishable items available. We headed to the soup aisle and honed in on the hearty Progresso brand offerings – legumes in all forms plus vegetable beef. That plus a loaf of uncut Italian bread and we were ready. 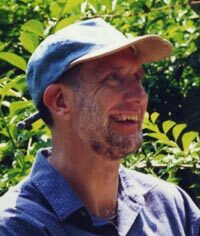 Each morning we quickly changed from our sleeping clothes – sweat suits, hats, mittens, socks – into our slightly warmer day clothes and huddled around the gas burners where, illuminated by flashlight, we heated our soup du jour and boiled water for tea. In fifty degree darkness we ate our warm breakfast, cleaned up, and headed out for our daily workout and shower. After a week of icy inconvenience we were able to return to our regular morning meal of Trader Joe’s O’s and turkey bacon. And Mars was ready to share her story with the Mouth of Wonder. Stacy was nonplused. Not that Mars wanted to talk about it – it should prove to be an interesting topic – but that anyone would actually eat soup for breakfast. Breakfast for dinner, or “brinner”, was becoming a movement in foodie circles – National Pubic Radio even covered it – but the reverse was apparently unimaginable. Just as it first seemed to me when Mars suggested it on Halloween. But, when she added “Okay, what else?” it sounded a lot better. So, at ten o’clock on the Monday morning before Christmas we all met at the studios of KSFR to tape the program. Stacy was still somewhat surprised and confused by our fast-breaking choice of food – even in a sort of emergency situation. Monica was amused by the whole thing. And Bram, who evidently without my knowledge had dabbled in soup for breakfast as a youth, had that “Well it’s my parents – what did you expect?” attitude. 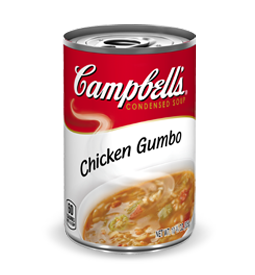 Mars recounted the whole story, including her love for Campbell’s Chicken Gumbo soup with buttered toast as a young girl. I somehow recalled a radio advertising jingle “Campbell’s soup! Campbell’s soup! For lunch or dinner or breakfast too. Soup everyday makes a SOUPER you!” which Stacy’s engineer found a copy of and edited in later. No converts were made, but neither was anyone sentenced to the Remedial Food Choice Class at the Betty Ford Culinary Clinic. We even were invited back by Stacy to appear on her Year End 2013 (and final Mouth of Wonder) radiocast. This time Mars talked about deep fried lobster tails and Smith Island Cake, the Maryland State Dessert. No one mentioned soup for breakfast. 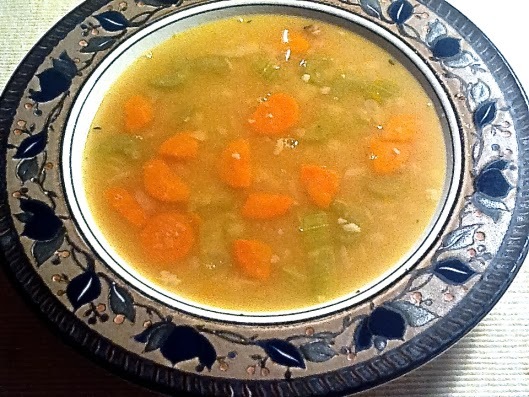 Like Marcel Proust’s Madeleine memory this essay was inspired by a large pot of lentil soup that Mars created several days ago and which we have been enjoying intermittently since then. In this variation of a potage that she makes frequently she added chicken hot dogs for more protein. Last evening we augmented the dish with some leftover pot roast and the remainder of its crockpot-cooked diced tomato gravy. I joked that possibly we could keep this particular soup going forever – adding different ingredients as we come upon them until ultimately we had something that was as much an existential question about the dish’s identity (”Is it still the same soup if the last original lentil is gone?”) as it was a tasty source of sustenance. But we have to be careful what we put into the mixture. We definitely do not want to end up with something that is too heavy for a lighthearted philosophical banter – or to be able to have for breakfast. What's the Heraclitus quote about not dipping your spoon into the same soup twice? Actually Lipton condensed soup posed a similar question in its 1970 commercials - "Is it soup yet?" Heraclitus would ask "Is it soup still?"